Adventure Tours in Bhutan: Bhutan has a lot of variety of things to offer from scenic beauty to spiritual satisfaction. 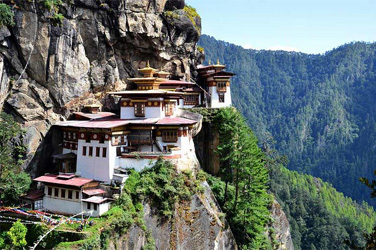 While Bhutan has been bestowed with beautiful mountains, it also boasts of one of the oldest monasteries as well. You can learn about modern Bhutan while experiencing villages. Bhutan adventure tour is the wonderful adventure tours in Bhutan which help to turn your dream into the reality. Bhutan is beauty and wisdom are revealed at each dzong, every Gompa and, most incredibly, in the eyes of every smiling Buddhist monks you meet. Visits to Paro, Thimphu, Punakha and Wangdue Phodrang, nature lovers, photographers, and culture junkies will uncover a purity of culture, traditions, and kindness. The first thing you will notice as you disembark is the transparent purity of air and the absence of noise. The Paro valley has kept its bucolic nature inspite of the airport and the existence of development projects. Fields, brown or green depending on the season, cover most of the valley floor, while hamlets and isolated farms dot the countryside. The houses of Paro valley are considered to be among the most beautiful in the country. Paro is believed to be one of the first valleys to have received the imprint of Buddhism.Check into Hotel. Morning: Drive to Drugyal Dzong (a ruined fortress - 16 km away from Paro town). The Dzong, although in ruins, holds great historical significance. It was from this fortress that the Bhutanese repelled many Tibetan invasions. The name means the victorious Bhutanese. This spot offers a magnificent vista of Mount Chomolhari, "Mountain of Goddess" (7329 m). Visit a typical Bhutanese farmhouse on the way back. A short distance south of the road is Kyichu Lhakhang. This temple is said to have been built in 659 by King Songtsen Gampo of Tibet. It holds down the left foot of an ogress whose body is so large that it covers Bhutan and most of eastern Tibet. Evening: Tea at the hotel and drive for two hours (65 km) to reach the capital city of Thimphu. Overnight: in Thimphu. Afternoon:Visit Semtokha Dzong. This is the oldest fortress in Bhutan, built in 1629 A.D. by Shabdrung Ngawang Namgyal. It also houses the largest monastic schools in the country. Visit Tashichho Dzong - the main secretariat building. It is from here that the King and other prominent civil servants run the country. The Head Abbot and the central monastic body also reside here during the summer. It's a 20-minute walk across the rice fields from the road at Sopsokha to the temple. The trail leads across rice fields to the tiny settlement of Pana. There are very few monks at the temple which is surrounded by a row of prayer wheels and some very beautiful slate carvings. Continue drive to Thimphu across the Dochu la pass. Afternoon free for shopping. Overnight: Paro.